A visit to the office turned up a huge, backlit, exposed concrete pillar in the reception lobby as the prime spot to yarnbomb. The simple thing would be to cover it with a cool pattern, but that would take more yarn and time to knit than we had, and that wouldn’t reflect our style of transforming objects in surprising ways. We also sketched a few string art installations that would interface between the pillar and the wall in the light, but the time and installation constraints kept us thinking. Brainstorming is a little like gold panning. It’s a long, tough slog with a lot of fool’s gold in the mix. But once you see that glint and gnash it between your incisors, you know you’ve hit gold. 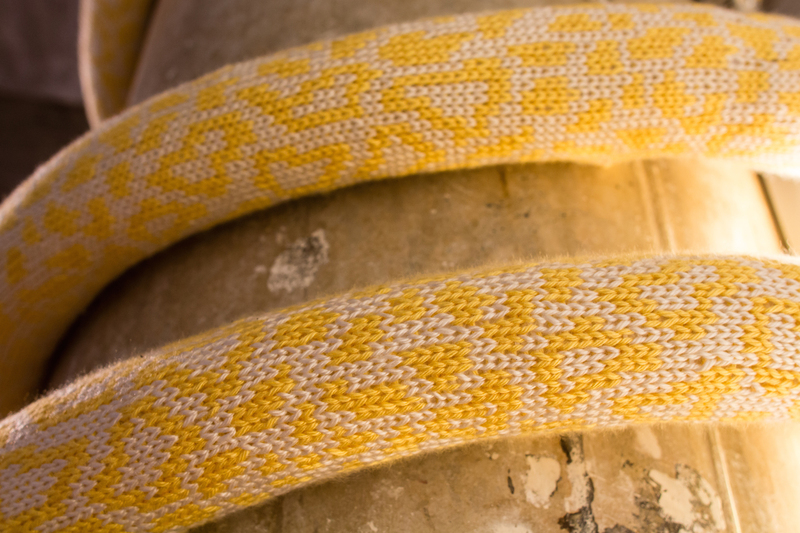 Inspired by the natural textures and playful pops of color in the decor, our gold struck as a pastel jungle snake coming at you from the rafters with his silky little knit scales. Meet Mort. 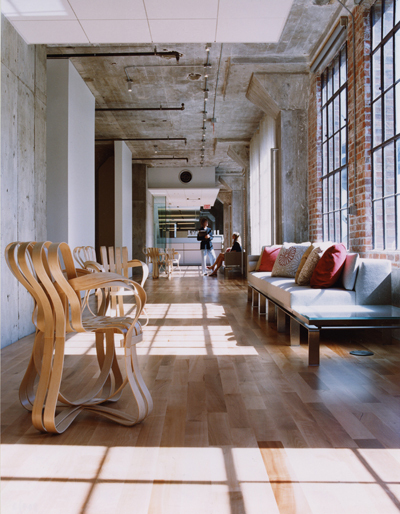 There’s a bit of a dialectic process between design, construction, and materials. You need some materials to sketch with, but you won’t know exactly how much until you’re on to the right design. Like an elaborate kaleidoscope, the colorwork chart, color palette, yarn tension, yarn weight, and infrastructure all get tweaked here and there until the final perfect design comes into view. The most important part is to play while you work to keep up spirit of the yarnbombing endeavor. And we’re pretty good at that. 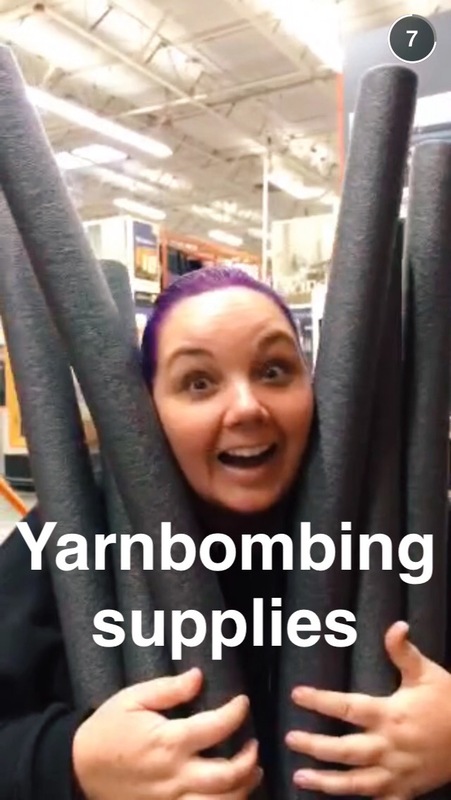 Nothing makes a fun SnapChat story like yarnbombing. Most yarnbomb installations require us to engineer new techniques and materials to achieve the right look. 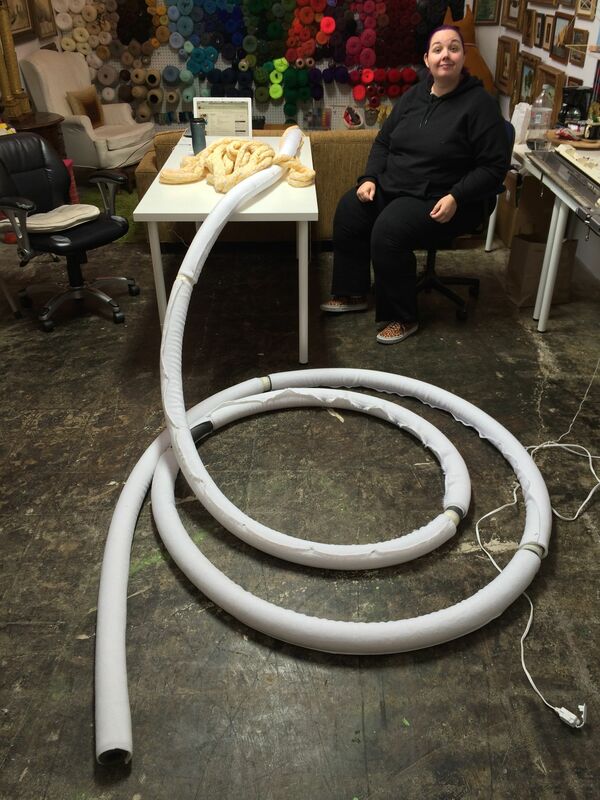 This time instead of stuffing the snake, which can look lumpy and uneven, we opted for connecting six lengths of pipe insulation. 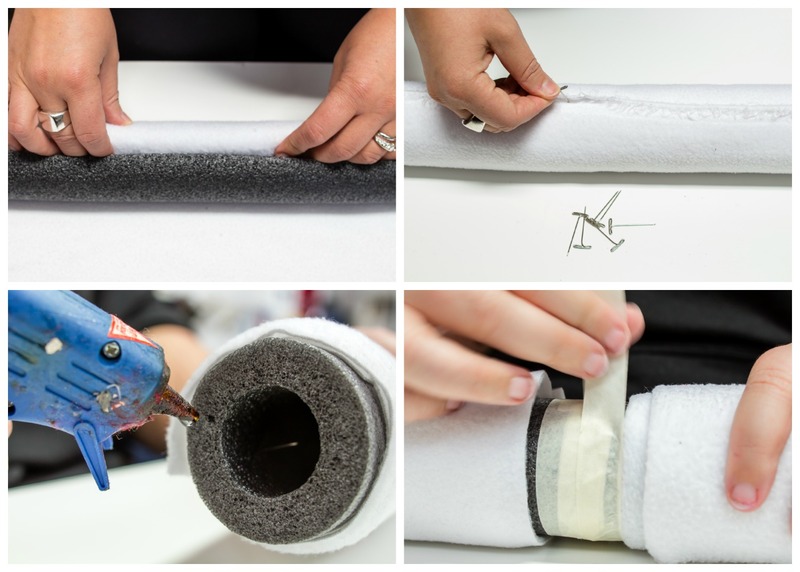 In order to give the snake a nice white underlayer and some additional padding, we rolled each section in fleece fabric before connecting them with low-tech hot glue and masking tape. 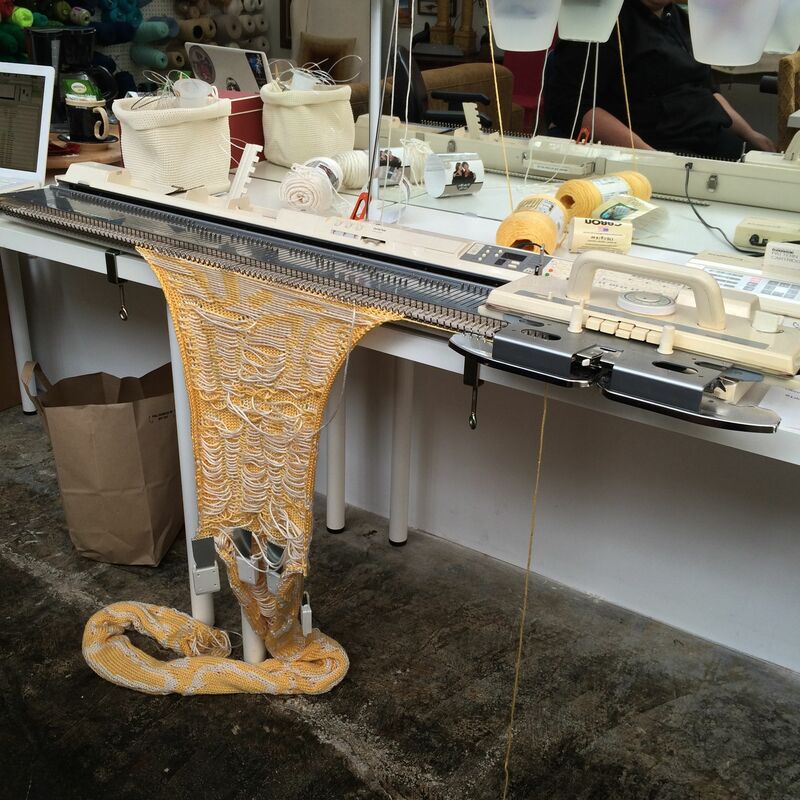 For the snake skin, we tried a few patterns on the knitting machine, including one that Jill designed in Photoshop starting with a python skin image, which she then posterized and pixelated. The vintage 80’s knitting machine we used on this project uses digital charts, but the process is laborious. Just to test Jill’s 200 by 50 stitch snake skin sketch required two hours of data entry. And we didn’t even use that sketch in the end! 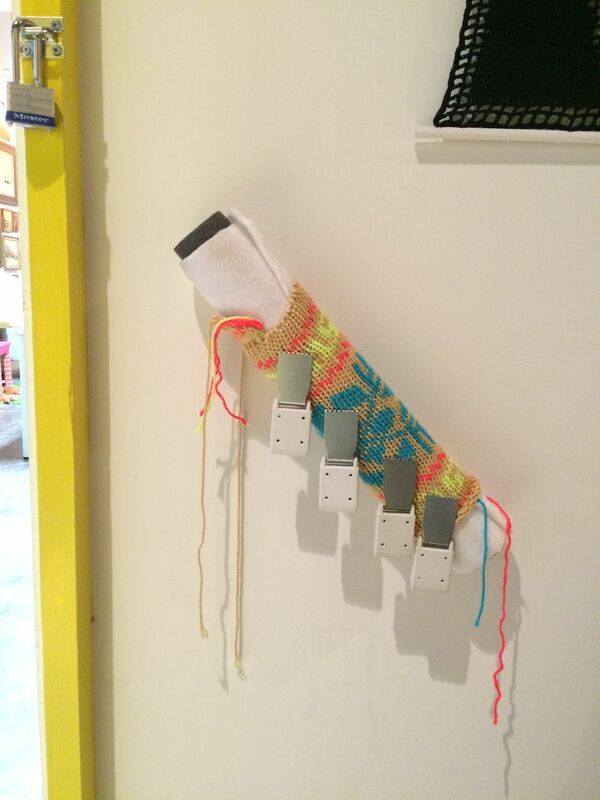 You can understand why we’re learning to hack this knitting machine with an Arduino. Once the chart is settled, the machine is hand-operated much like a loom. 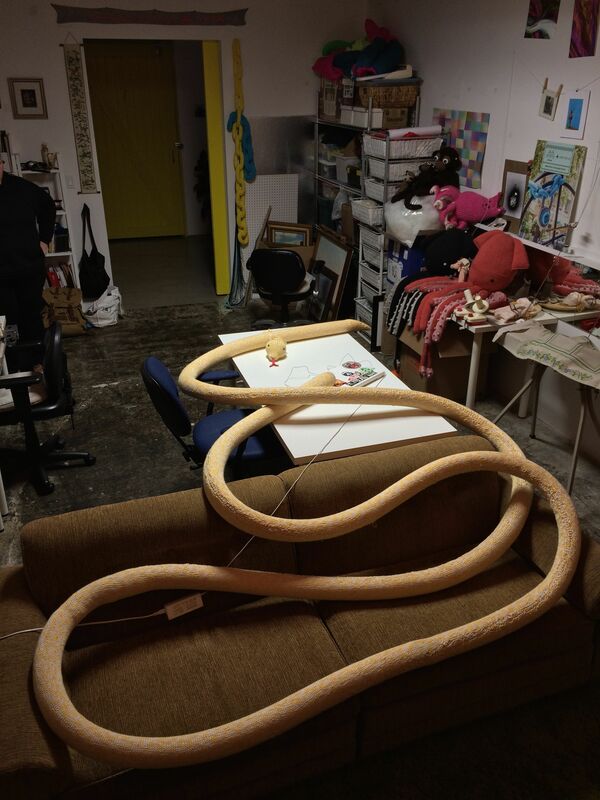 We took turns knitting 300 rows each for this 36 foot snake skin. For die-hards, you can find info about the yarn, colors, tension, and more on the project’s Ravelry page here. Because we could hide the seam against the pillar, we didn’t bother spending hours sewing the skin on with an invisible mattress stitch seam and just used a messy whip stitch seam. Even so, sewing took about 4 (wo)manhours. While machine knitting is great for rectangles, we prefer to hand knit or crochet details. 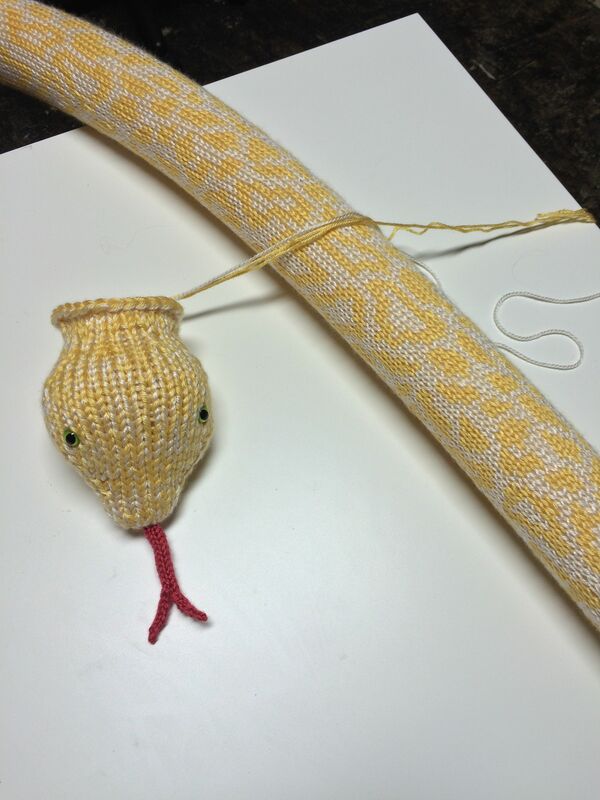 A quick search for snake under free knitting patterns on Ravelry led us to this Sweet Little Snake pattern. 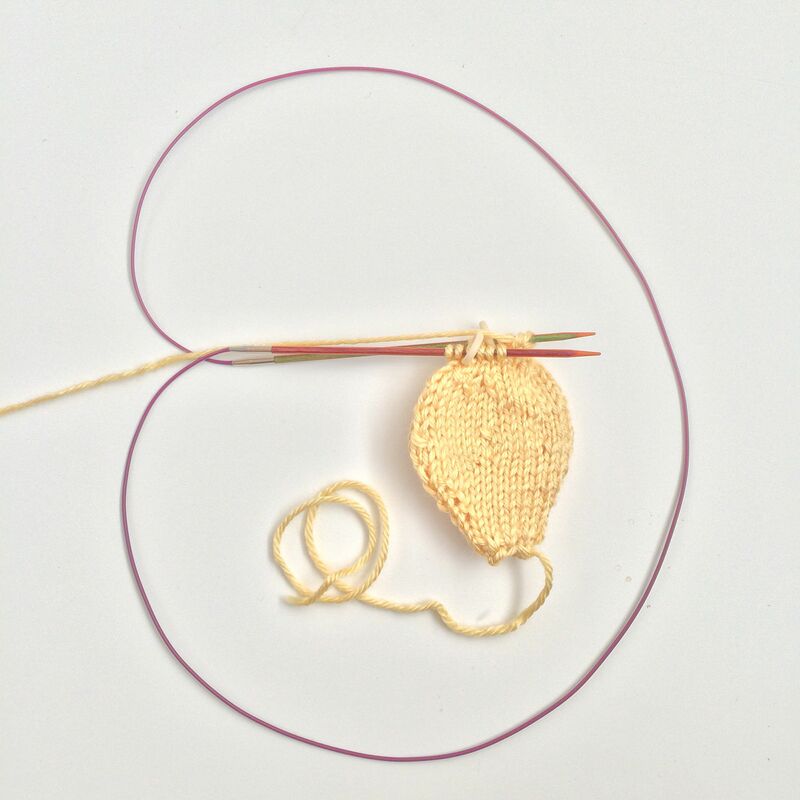 We knit up the head, liked the shape, and scaled it up in size with our favorite method: holding the yarn triple (two yellow and one white strand for a mottled look) and switching to appropriately larger needles. A couple finishing touches of safety eyes and an i-cord tongue completed the look. 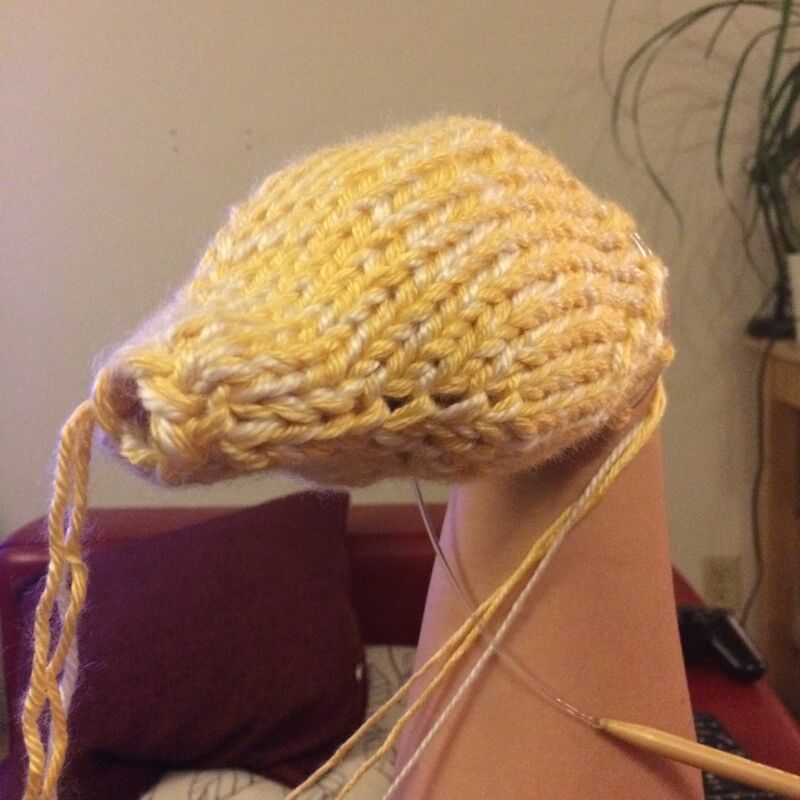 For the tail, we took the gauge of the head, cast on the right number of stitches in the round for the circumference, and knit a tapered cone in the same manner. To attach the hand knit details, we used a nice Kitchener stitch, waiting to add the head until after we installed the body to get its angle just right. We affixed the snake to the concrete with our new favorite material: sticky back hook Velcro tape in bulk from ULINE and a little hot glue in places for added strength. 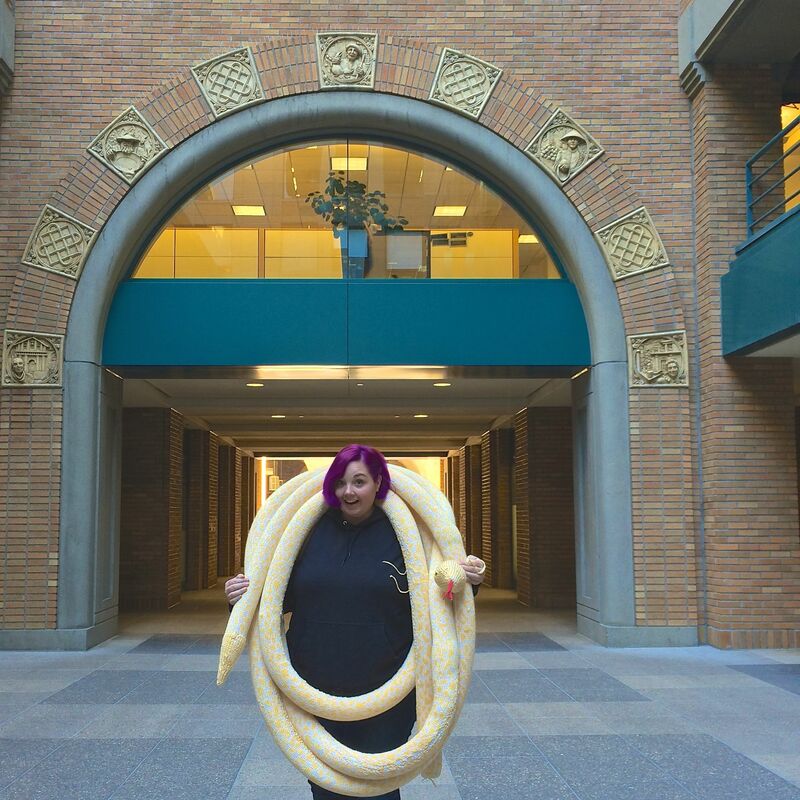 Our Old Navy installations popped thanks to Velcro, but we weren’t sure it could hold up a 36-foot snake. To test its strength, we installed a short section of piping in the studio overnight with weights hung on to simulate time, and it didn’t budge. To ensure the tape adhered well to the concrete, we washed and dried the column first. Importantly, we arced the snake away from the lamp on the back of the column to avoid contact with its warmth. All told, this project took about a week. After the initial communications and site visit, we spent two days brainstorming, designing, sketching, and sourcing materials. We spent another day on fabrication and two hours installing before the reception. 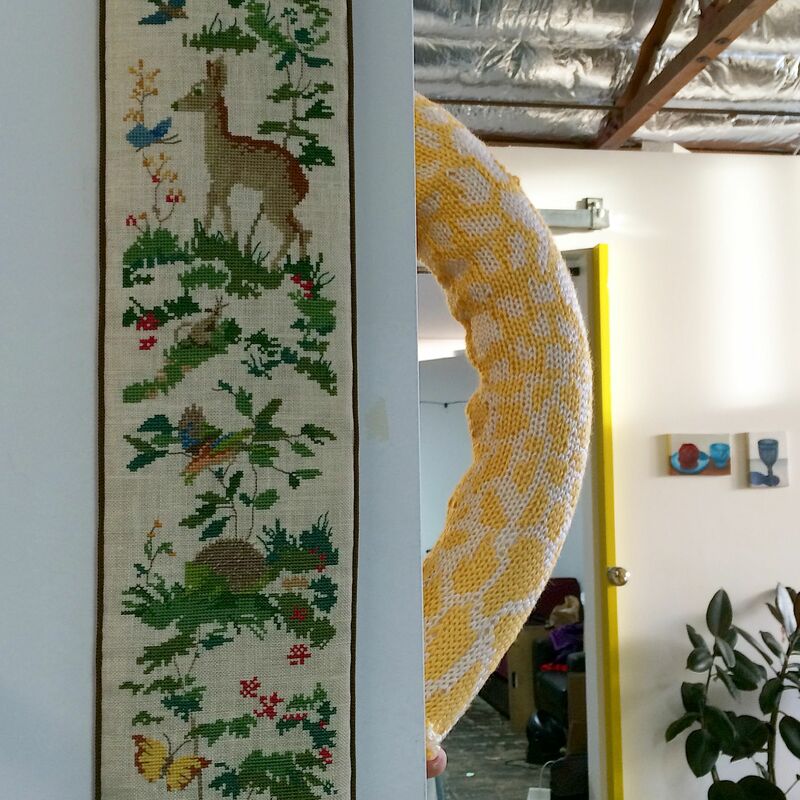 The piece will be up for 3 months, after which it will slither on to a new home. 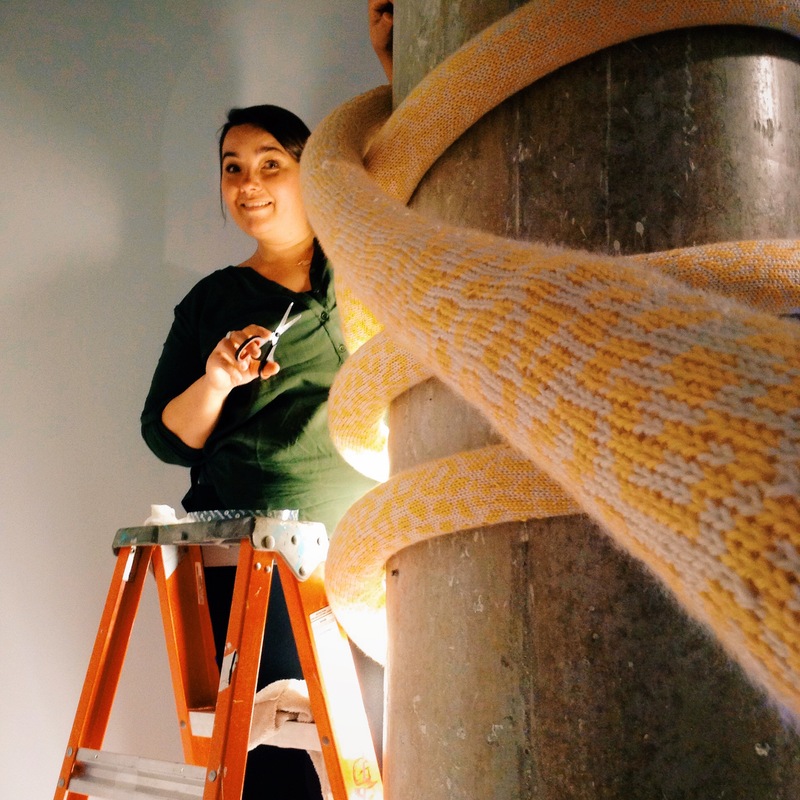 We hope these details inform and inspire you to take your knitting, crochet, and yarnbombing to the next level. If so, do let us know on Instagram @knitsforlife and @thedappertoad. See you next time!